advent candy christmas candy easy five or fewer four ingredients fudge gift this! You'll need an 8x8x2-inch square pan for most fudge recipes, and this one is no different. However, I love using my mini Le Creuset 7 x 5-inch baking dish, too. If you have one, this recipe fits in it just fine. 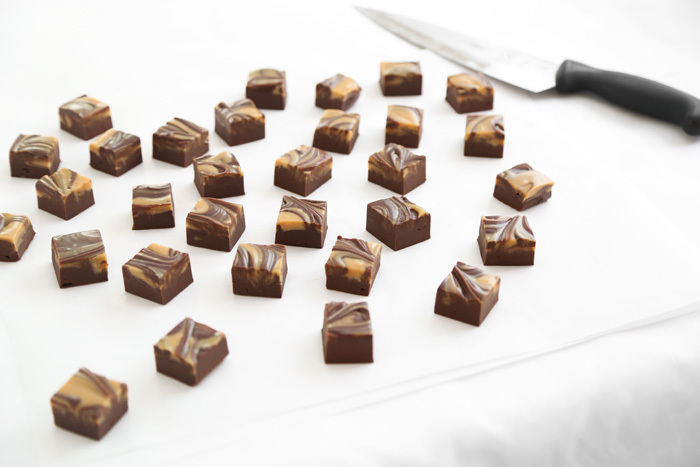 The great thing about fudge is that one batch makes many servings (about 32 pieces), so there's plenty to share. When I make fudge for stocking stuffers, I divvy the pieces up 6 per cellophane bag.That's about 5 stocking stuffers with a few pieces leftover for snacking. 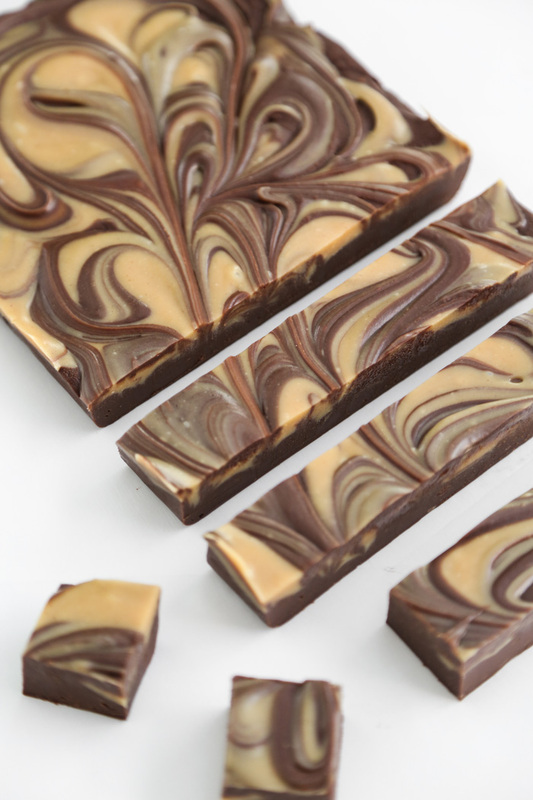 This is one of the easiest fudge recipes I've ever made, and it's pretty, too! 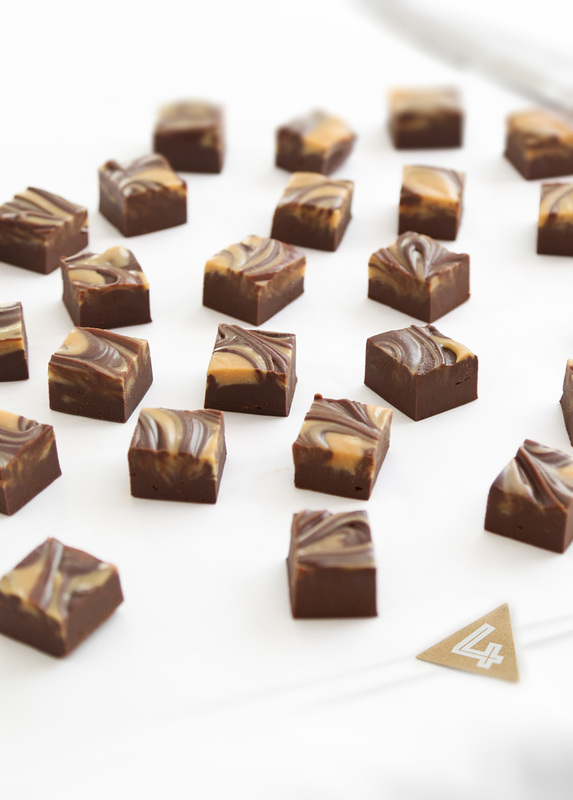 It's silky smooth and its flavor is reminiscent of a peanut butter cup. I love getting creative with the packaging of holiday treats. As I mentioned earlier, I usually opt for a simple cellophane bag with festive ribbon, but a pretty candy tin works well for gifting an entire batch of fudge. 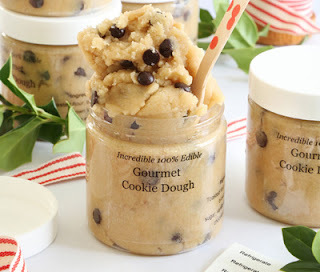 Gourmet Toasted Cookie Dough in a Jar! Grease an 8x8x2-inch square baking pan with butter or shortening and line with parchment paper that overhangs all four sides of the pan (the grease will make the paper stick to the pan). Combine the semisweet chips, 2 tablespoons of the butter and 1 cup of the milk in a large microwave-safe bowl. Heat at 30 second increments at 100% power until the mixture can be stirred smooth, about 1 minute 30 seconds. In a separate bowl, combine the peanut butter chips, the remaining 2 tablespoons butter, and the remaining sweetened condensed milk. Use a small rubber spatula to efficiently remove all of the milk from the can. Heat in the microwave in 30 second increments at 100% power until the mixture can be stirred smooth, about 1 minute. Pour the chocolate mixture into the prepared pan followed by the peanut butter mixture on top. Use a butter knife to swirl the peanut butter portion into the chocolate portion. Refrigerate until firm, about 2 hours. Lift the candy from the pan using the overhanging parchment paper. Cut into 2-inch squares. Package in a festive air-tight tin or in cellophane bags tied with ribbon for gift-giving. This fudge is definitely going in my holiday gift bags! :-) Quick question: Is there any reason not to use chocolate wafers/disks, or do the chocolate chips specifically impart any structural/chemical benefits? Same thing with PB chips vs. smooth peanut butter? Thanks! Thank you very much ! Original gift simple to make ! Have a pleasant week ! Thank you very much ! Original gift, simple to make ! Have a pleasant week ! Oh yes please! 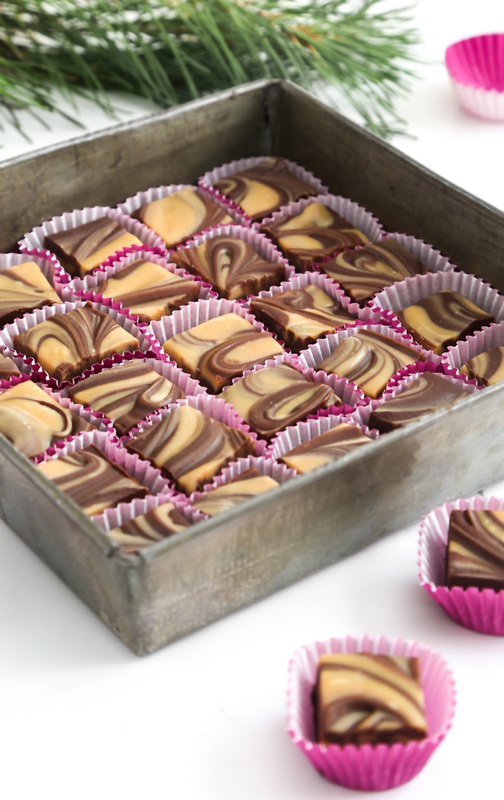 peanut butter and chocolate are pretty much bffs and especially in fudge! Yum! Peanut butter & chocolate is always a great combo! Excited to make this! Do you know if you can make in advance and then successfully freeze this fudge before gift giving? Yes! This fudge freezes well! 14oz of condensed milk divided, then saying add 1 cup to the chocolate and 1 cup to the peanut butter is very confusing as I nearly added too much to the chocolate. Can this be changed to alleviate further confusion? For the peanut butter portion, it says in the recipe: In a separate bowl, combine the peanut butter chips, the remaining 2 tablespoons butter, and the remaining sweetened condensed milk. Where did you get your cute square purple liners? How do you store your fudge? In the fridge? In a container on the counter? Hi! This fudge is shelf stable, so it can be stored in a container on the counter top. thanks for sharing, but I'm as confused as the Unknown person last year. I use metric measurements, but also have cups at home. However, if I fill my 1-cup cup with the milk, there will be nearly nothing left for the peanut butter, while Internet converters vary a lot, suggesting that 1 cup condensed milk can be 306g (just above 3/4 can) or as little as 150g (less than half a can). Could you please tell me how much of the can you put with the PB approximately, please? Hi! My one cup measure holds about 10.35 oz. (294 grams) of the sweetened condensed milk. The milk left over for the peanut butter swirl is about 3.05 oz. (87 grams). That comes to about 13.5 grams total condensed milk for the recipe, which is the best I could effectively scrape out of the 14oz. can with a rubber spatula. I hope this helps! Thanks for brining my attention to the question I missed previously! Thanks a lot for your speedy & accurate answer, Heather!